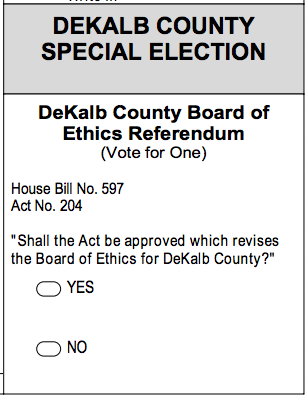 Medlock Area Neighborhood Association (MANA): DeKalb Ethics Reform: vote on November 3! On November 3, DeKalb voters will have the opportunity to vastly strengthen the code of ethics that governs county operations. And you would never guess it by the rather bland wording on the ballot. Ms. Patricia Killingsworth, author of the article that follows, was so kind as to join our community meeting on October 19. An audience member asked if she had heard anyone voice opposition to the ethics reform proposal. Ms. Killingsworth replied that she has seen pushback from two groups: county contractors who are not happy that they too will be bound by the new code of ethics, and individuals who stand to benefit from an ill-run county government. That says a lot. The reform bills discussed below are remarkable examples of grassroots collaboration between concerned citizens and responsive legislators. Please discuss the ethics reform bill with your friends, relatives, neighbors and co-workers so there is no cynicism or confusion clouding this important vote. The following article appears in the Fall 2015 issue of Medlock Matters. For sample ballots for the coming election, click here. In February 2014, a group of dedicated citizens came together at the request of Commissioner Kathie Gannon to form Blueprint to Reform Dekalb. This citizen committee determined that the initial issues that should be addressed in order to have the most immediate impact on reform involved oversight and transparency. Purchasing rules were written solely at the discretion of the CEO, were not published, and could be changed at any time, resulting in an open invitation to much of the corruption we have witnessed. Despite the fact that the position of Internal Auditor had been funded for well over five years, it had never been filled. No forensic or management audit of DeKalb County government had been performed for more than a decade, even though studies had been commissioned recommending both. And the Board of Ethics, appointed by the CEO and Board of Commissioners, was chronically underfunded, understaffed, and often without sufficient members to reach a quorum. Blueprint focused their attention on those three issues in pursuit of legislative reform. After months of research by Blueprint members, consultations with several members of the Operations Task Force, and with the actions taken by Senators Elena Parent and Gloria Butler, and Representative Scott Holcomb, reform legislation was introduced in the Senate and the House this past session. House Bills 597 (Ethics), 598 (Purchasing), and 599 (Independent Internal Audit) passed with the unanimous consent of the DeKalb Delegation, the House, and with only one dissenting vote in the Senate. Many civic organizations were involved in getting the bills through the legislature, including DeKalb Strong, Good Growth DeKalb and DeKalb Citizens for Good Government. This past year has been clear proof of the fact that dedicated citizens in this county can, and do, make a profound difference in the governance of this county. Purchasing reforms: Purchasing rules will continue to be written by the CEO, but now must be approved by the BOC before going into effect. Formal sealed bids will be required for all purchases exceeding $50,000. The BOC must approve all purchases exceeding $100,000, as well as all purchases from vendors who have more than one contract with the county. Subdividing contracts or subcontracts for the purpose of avoiding BOC approval will result in the contracts being void, and the contractor being subject to debarment from further contracting with the county. All purchasing contracts must be published on the county website within 30 days of approval. Independent Internal Audit: A credentialed oversight committee is now being selected which will interview candidates for the position of Independent Internal Auditor, and will recommend 2-3 qualified individuals to the BOC for approval. The appointment of the auditor must be made by the BOC within 30 days of receipt of the nominations, or the oversight committee will make the appointment for them. The qualifications for the position are exacting and, once selected, the auditor and his/her office will be entirely independent of control by any other county official. The auditor is charged with performing both financial and performance audits, and has subpoena power. The auditor shall make annual reports to the audit oversight committee, the CEO and the BOC, and the report will be published on the county website in a retrievable fashion within 10 days of submission to the commission. The Code of Ethics has been entirely rewritten, and is now consistent with national guidelines for local legislation. The board of ethics is completely independent and not subject to the control of any other officials, departments or agencies of county government. The seven members of the board will serve staggered 3-year terms and will be appointed by independent organizations, including the DeKalb County Bar Association, Chamber of Commerce, legislative delegation, probate court judge, chief judge of the superior court, a committee of the six major colleges and universities in DeKalb, and Leadership DeKalb. There are time limits on the appointments, and the members must be residents of DeKalb County and meet certain standards for service on the board that will ensure that there are no conflicts of interest. A staff position of ethics officer has been created, and the officer shall be appointed by a majority of the ethics board, and confirmed by the BOC and CEO, to a term not to exceed six years. Among other duties, the ethics officer will be responsible for educating all county officials, employees and appointees on ethical conduct; monitoring a "hot line"; informing the board of all complaints and alleged violations of the ethics code; reporting suspected ethical violations to the board, and suspected criminal violations to law enforcement agencies; obtaining disclosure reports and making them available to the public; and filing an annual report with the Board of Ethics, CEO, BOC and the public. Complaints will be handled much more efficiently, with subject matter jurisdiction determined within 30 days, and hearings scheduled promptly once it is found that the board has jurisdiction to review the matter. Complaints that remain unresolved for months, sometimes more than a year, have been tremendously frustrating for not only the individuals who filed the complaints, but also the officials whose reputations remain in question until the case is resolved. These rules are designed to expedite advisory opinions, hearings and rulings by the board. Upon reading the recent Bowers-Hyde Report on county corruption, it is clear that the very reforms that were envisioned by a citizens committee in 2014, and enacted in the legislature this year, are directly on point with the reforms necessary to combat the problems addressed in the report. As residents of DeKalb County, we have to take responsibility for monitoring the actions of our government, both through the oversight of county actions and through the election of honest and capable public officials. I urge you all to become more involved in community and county affairs, to help select and elect good county officials, and to VOTE!